During our two weeks travel around Puglia in Italy, Franck and I spent 7 days discovering the Salento. This is such an interesting region! We visited Lecce, Otranto, Gallipoli, Locorotondo and Galatina. While Puglia is one of the poorest region of Italy, we were surprised to discover so many churches and cathedrals in such good condition and so richly decorated inside. Besides the religious buildings, we also visited other historical buildings and even a surprising natural site! More than any other city in Puglia, Lecce impressed us with its profusion, richness and excellent preservation of its architectural estate. The city is overflowing with cathedrals, basilicas, churches and other religious buildings from the baroque period. That’s why Lecce is considered one of the European capital of baroque art. The building facades, all built out of limestone, combine together to give the city a harmonious appearance. At the same time, many details carved in the rocks make each of them unique. The insides of those religious buildings look even more impressive. They are decorated with many sculptures, paintings, gold decorations and statues. When I think about these churches and cathedrals the first words that come up in my mind are splendour and refinement. Sometimes, Lecce history is shown through its architecture, reminding us of the Greek settlement. Indeed they founded Lecce in the 4th century BC. With so many beautiful things to see, I can’t review each of them so I will talk to you about my favorites places in Lecce. This cathedral is one the most important in Apulia. It is really splendid inside. Chapels, walls and even ceilings are richly decorated with gilded decorations and magnificent stained glass windows. Accessibility: The main entrance is not wheelchair accessible because there are steps but it is possible to enter the cathedral by using the ramp in Vicolo Sotteranei street. However this entrance is quite narrow: I barely fitted while my wheelchair in only about 60cm width. The crypt is not accessible to wheelchair users. I really liked to visit the church “Chiesa di Santa Chiara” which has been built in the 15th century but is still unfinished. The facade is beautiful and a bit impressive. Inside, once again, we can see the superb baroque art with great paints above each chapel and the altar. If you look even higher you will notice that this upper part of the church is not complete as there is any ornementation. Other distinctive feature of this church: the ceiling is made of papier-mâché. Accessibility: Unfortunately, this church is not wheelchair accessible. There are stairs to get inside. For once the outside is more interesting than the inside! Indeed the facade is made of two parts : one concave and one convex. Look at it! Chiesa di San Matteo, Lecce. 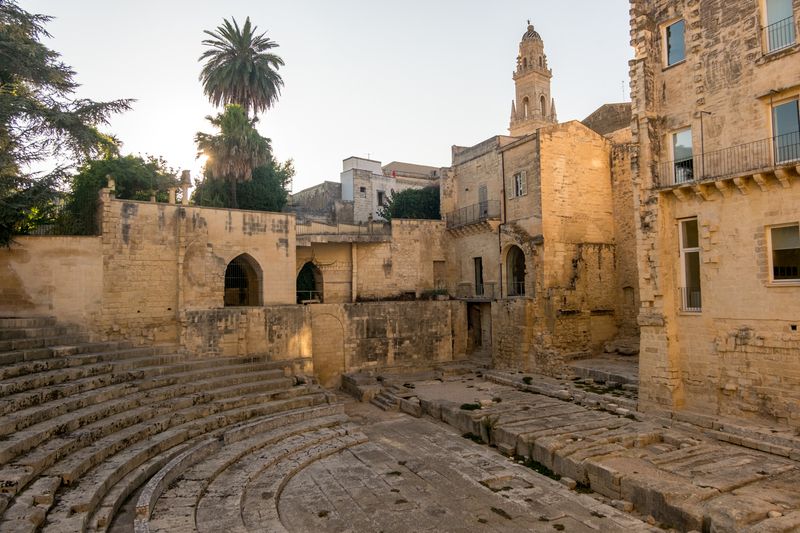 In Lecce you will find a well-known big roman amphitheatre in the centre plaza. But hidden down Lecce small alleys, you can find a secret roman theatre, built in the 1st and 2nd centuries. It is surely not the Colosseum but this theatre managed to bring me back some centuries ago. While observing those yellowish rocks, which are even more charming under the sunset light, I thought about gladiators fighting (I know, this a theatre and not an arena but still!). But times change… Today many wild cats made this historical building their home. Unfortunately they are not in great shape. Most of them seem to have an eye disease. Also named Church of the Holy Cross, you will find this basilica in every travel guide about Lecce because of its magnificent and exorbitant frontage. Unfortunately we couldn’t see it as during our stay, it was under renovation. The city is flat and the ground is made of big flat pavements (more like tiles) which are easy to roll on with a wheelchair. It is quite easy to get around Lecce in a wheelchair. Where to sleep? At the agriturismo “Masseria la Lizza” in an abbey renovated by Luigina who will welcome you with a generous smile and will be available to help you plan your visits in the region. The breakfast is a great time to have a chat with her. Plus, breakfasts are awesome! Regarding accessibility, it is possible to park your car just in front of the disabled guest room to avoid to have to roll on gravels. There is a 4cm sill to enter the room which is spacious. It is easy to get around in the wheelchair. The bathroom is equipped with a shower seat, grab bars in the shower and near the toilet. The only problem might be the bed. Indeed there is a 23cm edge between the outside of the bed and the mattress (photo below) so it could make transfers difficult for some people. Also to get to the breakfast room there is a step but it is possible to ask Luigina to eat in your room (there is a table) or on the terrace. Disabled room, masseria La Lizza. Gallipoli feels different. The city is less picturesque and calm that the others we visited. When you will arrive near the old town you will not meet grannies making pastas but fishermen unknotting their nets. Behind these scenes and the fishing boats, we can see some pleasure boats. That reminded me my childhood and the Sundays family strolls in the Finistère harbours to observe the boats. After crossing the bridge between the fishing harbour and the old town, that a different neighbourhood. We are now in Gallipoli historical heart, a place that was conquered by Greeks, Romans and even Normans a few centuries ago. But today, unfortunately, there are a lot of tourists shops in the streets overwhelming the old town. However it is still quite enjoyable to take a stroll around. By moving away from the main streets it becomes quieter and at the beginning of the evening we can even admire a glittering sunset above the sea while drinking a cocktail. But before that don’t forget to visit the cathedral “di Sant’Agata” to admire the many awesome oil paints covering the walls. There is a ramp to enter in the cathedral di Sant’ Agata but there is one last step going down just behind the door. The old town ground is covered by uneven cobblestones. It is still possible to get around but that’s quite difficult and not comfortable. Manual wheelchair users will need someone’s else help sometimes. The city centre (not historical) is easy to get around in a wheelchair but there is nothing special to visit there. I really enjoyed to stroll in the seafront along the remparts. This area of Otranto is perfectly wheelchair accessible whereas the centre of the old town is very difficult because of cobblestones and steep streets. So it is necessary to be with someone who will help to visit the center. But even if visiting Otranto old town has been challenging we made some interesting discoveries! This Norman cathedral built during the 11th century is known for its mosaic covering its floor. This mosaic represents a tree of life gathering illustrations of animals, mythological and biblical figures. Even the devil is pictured in it! But I didn’t really appreciate this mosaic even if I admit that this is quite a work of art! However I found more interesting the chapel situated in the back of the cathedral. In there, we can see hundreds of skulls and bones behind window panes. Those are the one of the 800 Otranto martyrs: the 800 people who refused to convert to Islam during the Turkish invasion in 1480 and have been beheaded. Accessibility: There are steps at the main entrance of the cathedral but there is a slope inside, hidden behind the door. You just need to ask someone to put it in place. Underneath the cathedral there is a crypt which is wheelchair accessible via a ramp located on the side of the cathedral. The wheelchair accessible entrance of the crypt. The castle of Otranto, “Castello Aragonese” is now a museum displaying an exhibition about 20th century Italian painters in the first floor and a permanent collection explaining the History of Otranto and its region. Non-disabled visitors can also have a look at the city from the ramparts. Accessibility: There is a platform lift in the castle allowing wheelchair users to get to the upper floors. The first floor is fully wheelchair accessible whereas on the second floor almost all the rooms entrance have a step (5 to 10cm high). The museum is free for people with reduced mobility and their accompanying person. One of my favorite sites in Apulia! I wasn’t expected such a surprising landscape in this dry region where only olive trees seem to grow. The bauxite quarry looks completely different. We could almost believe that we were walking on Mars because of the red soil. Except that there is a beautiful lake and many lizards! The place is remarkable. Its intense colours reminded me a bit of the incredible geothermal phenomena in New Zealand. Accessibility: To reach the bauxite quarry it is necessary to walk/roll during 5 minutes from the parking (which costs 3 euros per vehicle). On 3/4 metres the pathway is wheelchair inaccessible so it is needed to be able to walk a few metres or to agree to be carried. Once in the quarry the ground is uneven and stony sometimes so it will be necessary to roll only on the backwheels or to be equipped with a freewheel (or an equivalent equipment). Franck exploring those surprising lands. It is difficult to park your car in Otranto centre despite the disabled parking spaces available. Enjoying a stroll along the seafront is easy in wheelchair as the ground is flat and smooth. However, getting around the historical centre is complicated because the streets are steep and cobbled. Lovely stroll along the sea in Otranto. You will find many wheelchair accessible restaurants along the waterfront, near the beach. Agriturismo da Marta (Via Orte, 73028 Otranto) is a must do! Have a diner here is a really nice experience. The food is very good, generous, simple but authentic. Every meals are cooked with home made ingredients from the farm. Including the flour used to cooked desserts and pastas! Only the wine is not home made. Plus, at the end of the meal you will meet Marta. Quite a woman! Despite being in her 90’s she continues to run the restaurant with her two daughters! And on the top of that, having a diner at Marta’s restaurant is affordable. Indeed for a full diner (aperitif, starter, first meal, second meal, dessert and wine) we paid 53 euros for 2 people. Regarding accessibility, there is an alley covered with gravels between the car park and the restaurant. So if you go there with someone else I would advice you to be dropped at the restaurant entrance. From there, there is a last small step. To book you will need to call +39 0836 801233 (Italian mainly/ a few words in English) or to go directly there the day before. During our travel we stayed in a double room with patio at the Agriturismo Fontanelle, located at 10 minutes driving from Otranto and near the beach. This accommodation is wheelchair accessible and is equipped with a adapted bathroom but it will not suit every wheelchair user as there are some design failure: the toilet seat is quit low (47cm high), transferring from the wheelchair to the toilet seat or shower seat is possible only if the wheelchair is less than 60cm width and there a small sill (2.5cm high) to enter the bathroom. The delicious home made breakfast is served in the garden every morning. The accommodation is close to a pine forest where it is nice to go for a walk. If you cross the pine forest you will arrive at the beach. But to reach the actual beach is impossible for people with reduced mobility as there is a small cliff to go down. Locorotondo and Galatina are two small villages, quite unknown from the tourists despite being worth the journey. They are perfect places to peacefully enjoy the Italian Dolce Vita and discover some magnificent churches. Locorotondo is one of my favorite places to visit in Apulia. It is a really charming village: calm and preserved from souvenirs shops in every streets. While walking in Locorotondo alleys you’ll more likely find craftmen shops. But before crossing the old town gate, from villa Garibaldi park, you can admire the view upon the olive trees fields and trulli scattered in the countryside. Then, in the old town, the church “Chiesa Madre Parrocchia di San Giorgio Martire”, also called Church of Saint George, is interesting to visit and is wheelchair accessible. Accessibility: There is a mobility car space in the street “Via Edmondo de Amicis”. From there, to reach the gate of the old town, you will need to walk trough a mild steep street. The beautiful church of Locorotondo. The Basilica Santa Caterina d’Allessandria is the reason why you should make a detour to Galatina. The paintings covering the walls of the basilica are really amazing and make it really unique. On some walls we can even see the superpositions of different coats of paints showing the basilica history through centuries. It seems that the facade of the basilica is also really beautiful but unfortunately we couldn’t see it because it was under renovation during our travel in Apulia. Inside the Basilica di Santa Caterina d’Alessandria, Galatina. Hundreds of olive trees along the apulian roads. Despite this, Puglia is a beautiful region. So if you want to travel there you can read my post about the first week of our travel in Puglia in the Terra di Bari and the Itria valley. You can also discover our travel budget and itinerary. Travellers with reduced mobility, this article about the most beautiful and wheelchair accessible beaches in Apulia can also be useful. Did you like this post? Feel free to check out my Patreon page to see how you can support the creation of new ones and be a part of iwheeltravel! And of course, you can share, like and subscribe, to be aware of the lastest posts. Never miss a new adventure! Subscribe here and get an notification for each new post.